First of all is an example of something which never usually happens: rather than slipping, the release date of the Butai Sengoku Basara 3 ~Setouchi Kyouran~ DVD has been brought forward from late March 2013 to late February. The end of March is already jam-packed full of Sengoku Basara excitement so I'm delighted that this will let me get a head start on the festivities. 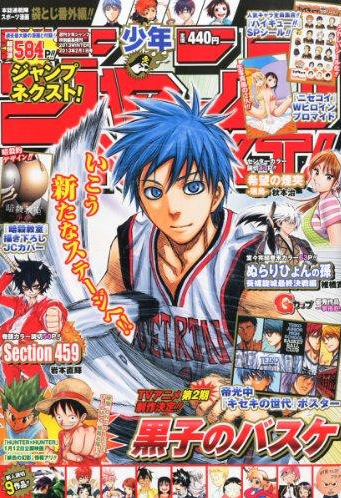 Secondly, it's been confirmed that Shounen Jump will be announcing a second season for Kuroko No Basuke! No details are known yet so I imagine we'll be seeing it in the Spring season next year. 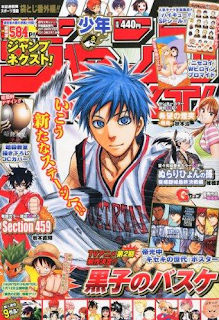 While a second season for an ongoing series with such a devoted fan following would ordinarily barely qualify as news at all, Kuroko No Basuke is a special case; its spectacular popularity has been impeded at every step since the first season finished. An unknown criminal was reported to be sending death threats, citing the series as the link between them. It's unclear whether their wrath comes from some personal grudge against mangaka Fujimaki Tadatoshi or a hatred of the series itself - though as a fairly innocuous character-driven basketball action story, it's difficult to see how anyone would single it out normally as an object of hatred. This person has been causing widespread panic and disruption for several months now, most infamously leading to the unprecedented ban on KuroBas circles and products at this winter's Comiket. It's been reported that the Comiket organisers have lost a considerable amount of money from this decision which they took to safeguard the visitors and the future of the event, but the real losers are the circles who had worked hard on their doujinshi and merchandise for the event who have had their plans ruined through no fault of their own. It's been said that 900 individual circles were excluded as part of the ban; many of those 900 circles will be made up of several individual creators. A significant number of them would have already arranged for time off work and booked their hotel accommodation, travel tickets and printing runs before the ban was announced; furthermore, their fans may have also made arrangements to travel all the way to Comiket too to visit their spaces and purchase their books. Thousands of fans were looking forward to celebrating Kuroko No Basuke at Comiket this winter, and all it took was one horrible person to completely ruin their plans and waste their money. Comiket is by far the highest profile disappointment that KuroBas fans have faced, but it wasn't the first. After one successful Shadow Trickster event following a threat, Studio You buckled under the responsibility (and perhaps, the additional costs) and cancelled a large number of their doujinshi meets. The fan community had high hopes that the organisers of Comic City would resist the pressure but sadly they too announced that KuroBas circles would be restricted at the large Comic City Osaka event at the start of January. There are a number of other doujinshi events scheduled throughout 2013 as well which will probably be affected if things continue. Kuroko No Basuke circles looking to sell their work outside of shops are out of luck - this is especially harsh for creators who aren't yet well known or mainstream enough to distribute through the dedicated high street doujinshi stockists. Even in the face of terrorism, the fans have remained loyal throughout and continued to purchase the goods which slip through the various bans and cancellations, yet the criminal has caused problems for the series commercially which go far beyond the doujinshi scene. Merchandise and a number of events have been cancelled and there was uneasy doubt when the last manga tankoubon was released in shops and found to be missing any mention of the expected second anime season. When these events are reported on western news sites, I often see people cynically remarking that it's a way for the creators to increase demand and make more profit. This is a series which is so popular that when a seven week special event took place at Ikebukuro's Namco Namja Town back in July, they sold out of all seven weeks' worth of merchandise on the very first day. There is no question that the death threats are harming KuroBas rather than helping it. The manga artist's defiance of the criminal continues, however, and the fans' patience is being rewarded at last with this new anime announcement. The ongoing criminal investigation has proved fruitless so far and the freak behind the threats will probably never reveal what on earth possessed them to act this way; at least we'll get to enjoy more of Kuroko's teamwork and misdirection while we wait for justice to be served. I can't wait to hear more about the start date for the anime, and to finally meet the new characters who were teased towards the end of the first season.